Today, I was fascinated by blue whales. Here are a few fun facts about this majestic creature. The blue whale is the largest animal ever known (including dinosaurs), and can grow to sizes of 180 tons. Their tongue alone can weigh close to 3 tons, which is close in size to adult male Asian elephants (ranging from 2-5 tons). Amazing. A blue whale song or communication can reach 188 decibels in volume. Front row at the rock concert (110 db), a military jet taking off (140 db) and instant perforation of the ear drum (160 db) are all quieter than a blue whale trying to start a conversation. Do not grab a seat next a chatty blue whale at the (sand)bar. It is estimated that only 5000-12,000 blue whales remain today, due to hunting and whaling. Before whaling began in the late 19th century, it is estimated that there were close to 300,000 blue whales on Earth. The broadclub cuttlefish, which inhabit the waters of Indonesia, can change the color and texture of their skin, just like the rest of its cuttlefish brethren. However, the broadclub is unique in that it will put on dazzling displays of flashing lights in order to stun its prey. It is truly a sight to behold. If you are planning a dance night at the hottest nightclub in town, be sure to invite the broadclub cuttlefish. Think that the broadclub is all fun and no substance? Think again. Cuttlefish, along with octopuses, have the largest brain/body ratio among invertebrates. This is the brain responsible for sending electrical impulses that control the 20 million color cells in the cuttlefish’s skin. The Kootenai River White Sturgeon is North America’s largest freshwater fish, capable of reach 19 feet in length and 1000 lbs. This monstrous beast has been around since the dinosaurs, but is now in danger of becoming extinct, as less than 500 still populate the Kootenia River in Idaho, Montana, and British Columbia . 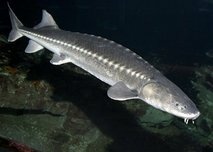 The White Sturgeon’s mating patterns have been disrupted by a dam that has changed the flow of water that has caused the fish to swim upriver and spawn. Attempts to recreate water flows at the site of the Libby Dam in Montana have been unsuccessful, and the fish may become extinct within 10 years if no fix is found. The Captain is rooting for you, White Sturgeon. Not ocean, seafood, or music related, but i gotta say, Tostitos Scoops! with a Hint of Jalapeno are just fantastic. If you’re craving some snack food, go get a bag and some queso for dipping. Just…fantastic. Jazzy funky soul group out of Columbus, OH. Check out Waiting; I’m lovin the vocals and horns. This group is quite eclectic, and you can hear some of their other stuff at myspace.com/mojoflomusic. They’ll be playing shows frequently at different venues across Columbus, I hope to get a listen in sometime. Everybody loves music, especially CaptainBlogBeard, and lesser-known musicians have got some real talent. I came across a local musician named Thor Winston, who is doing his thing on the Columbus scene with some smooth R&B/pop. His single, Thinking ’bout U, is a shanty with an incredibly catchy hook. Check him out on iTunes (search Thor Winston in the iTunes store), or visit his website ThorWinston.com.